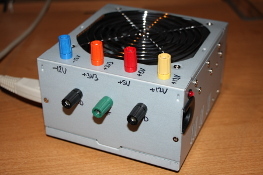 There have been many occasions at home whilst playing with electrickery that I've needed a decent power supply, so I thought about buying a bench power supply. However, the cheapest decent one was going to be £120 for a dual 30V output at 3A. So, as a cheaper (and more powerful) alternative, I bought an ATX power supply from Maplin and set about converting it into a usable bench supply. 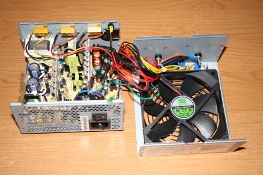 The power supply is rated at 680W. 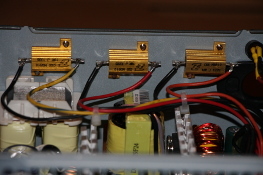 Each of the main supplies can deliver far more current than the binding posts (15A), so I've effectively got +12V, +5V and +3V3 at 15A capacity (the PSU has maximum ratings of 26A, 24A and 56A respectively - obviously they all can't draw their maximum at the same time as that would exceed 680W) and -12V at 0.8A. Being an engineer who likes to do things right, I was wanting to get 4mm "banana" binding posts in the right colours (i.e. 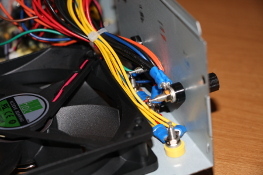 the same colours as in the ATX power cable). I spent ages trying to find somewhere that stocked the full set in the same style. Eventually, I found what I wanted at Digi-Key. I say this because I've seen many examples on the web of people using a 10W resistor - quite clearly that's going to melt!!! [*1] I used an M3 x 0.5mm tap on the resistors to allow me to use some standard M3 screws - the ones that you'd normally screw a motherboard into the case with. [*2] Don't forget that unless you have another switch on the front / top, you'll need to connect the green "Power On" wire to ground. 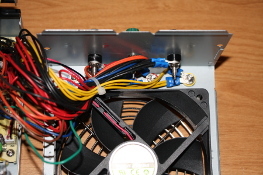 Of course, if you happen to have a spare ATX power supply lying around, then you can half your cost. I also added a red LED to the box so that I knew when it was powered on, without having to check if the fan is spinning.